The children who find themselves in the saddle for the first time are symbolically incorporated into the Cossack community. The Shermitsii festival is a master class in Cossack athletic skills and prowess; featuring ringing blades, the sound of hooves and spectacular stunts from the masters of the southern Russian steppes. The legendary valour and courage of the Russian Cossacks is widely known. The daring and freedom-loving riders hail from the Kuban and Don steppes in southern Russia. They were particularly appreciated in the tsarist army for their courage and excellent military training from the 18th century up until the Bolshevik Revolution. From the earliest times, the Cossacks honed their combat skills at the Shermitsii, a festival centred on "exemplary" or show fights. The modern army no longer needs help from the Cossack horsemen, but these show traditions are carefully preserved. The Shermitsii is a series of "exemplary" or show fights, which are staged by the Cossacks and timed with the holidays. The largest ones, for example, take place on ‘Maslenitsa’ (Pancake Week) and Trinity Sunday. What do the Shermitsii games involve? The Cossacks have always been experts with bladed weapons, so the main event at Shermitsii is fencing, with sabres and spears. Since contestants do not aim at cutting or stabbing the opponent, the sabre is held with the cutting edge facing backwards, while the spear's edge is replaced with a soft tip. In training and games, sticks are used instead of real weapons. Another popular entertainment is cutting targets on foot. The participant must complete an obstacle course on foot or on horseback, hitting targets as they move. A certain amount of points is earned for a fixed period, so the course needs to be completed as quickly as possible. Other than fencing and hitting targets, another major attraction of the Shermitsii is hand-to-hand combat. The two most common variants of the fight are in the circle and on the carpet. In the former, fighters need to push their opponent out of the circle and keep them there for a few seconds. In the latter, they need to put their opponent on the mat and not allow them to get back on their feet for a short duration of time. After the spectacular fights with sabre and fists, it is difficult to further surprise the viewer, but then comes the race; perhaps the most exciting part of the Shermitsii. It is a real spectacle: The Cossacks dress up in their traditional costumes, gallop on horses, shoot, joust with spears and perform complex acrobatic routines. Where can you see the Shermitsii? The Cossack Shermitsii festival is held annually. Since 2010, it has been the national sport of the Rostov Region, so the banks of the Don River are unquestionably the place to go for the most impressive displays. One of the most famous Shermitsii festivals is held in May in Starocherkassk (670 miles south of Moscow), in the St. Anna fortress. It is open to all spectators, but only Cossacks are allowed to participate. According to an old tradition, entire families come to the Shermitsii beneath their family banners – families of several generations get together. The Cossacks are an austere people, so winners do not receive any financial awards. However, the most dashing competitors are not left completely empty-handed. At the most recent Shermitsii in May 2016, the winner of the horseback archery competition was awarded a full set of handmade mounted archery gear. For a real Cossack, this is even more valuable than money. What else happens at the Shermitsii festival? At the Shermitsii, be sure to observe the children's initiation rite for entrance into the ranks of the Cossacks. The continuity of generations is sacred for these knights of the steppe. When they complete the competition young Cossacks, aged between three and 10, are solemnly seated on a horse. 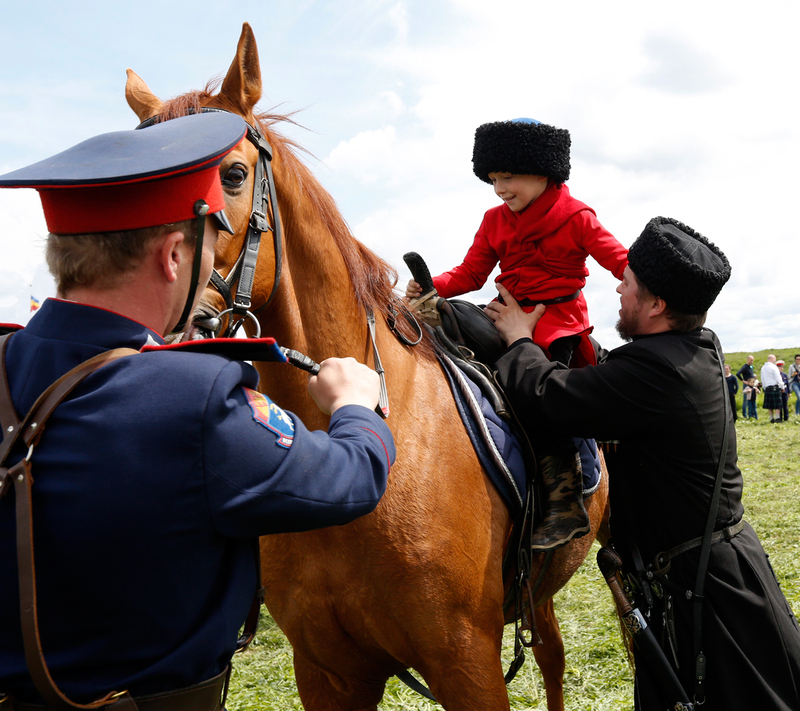 The children who find themselves in the saddle for the first time are symbolically yet formally initiated into the Cossack community – a touching moment.